A year before Congress and President Trump enacted significant corporate tax cuts, the United States was already among the bottom third of developed countries in the share of its economy going towards corporate taxes. The Organization for Economic Cooperation and Development (OECD) includes most developed countries with which the United States trades and competes. The most recent OECD data, for 2016, show that most of its member countries collected more corporate tax revenue, measured as a share of their economic output, than the United States did prior to the recently enacted Tax Cuts and Jobs Act. U.S. corporate tax collection was equal to 2.2 percent of the nation’s gross domestic product (GDP) in 2016, significantly less than the average 2.9 percent collected by the other 34 other OECD countries for which data were available. A year after OECD collected this data, Congress passed the TCJA, which slashed the top U.S. statutory corporate tax rate from 35 to 21 percent and created other new tax breaks for corporations. To approximate how the TCJA will affect future U.S. rankings, ITEP took the official cost estimates of the TCJA’s corporate tax provisions from Congress’s Joint Committee on Taxation and estimated how much they would reduce corporate tax revenue as a share of GDP if they had been in effect in 2016. We found that had the new corporate tax rules been in place in 2016, the United States would have had the absolute lowest corporate tax level of any developed OECD country, at just 1.5 percent of GDP. [i] This means that absent a dramatic change in corporate tax laws in other developed countries, future OECD analyses will likely show that the United States is taxing corporations less than any other advanced economy. While some observers of tax policy focused for years on the U.S.’s relatively high statutory corporate tax rate of 35 percent, several analyses from ITEP demonstrated that most American corporations paid an effective corporate tax rate that was lower than that. 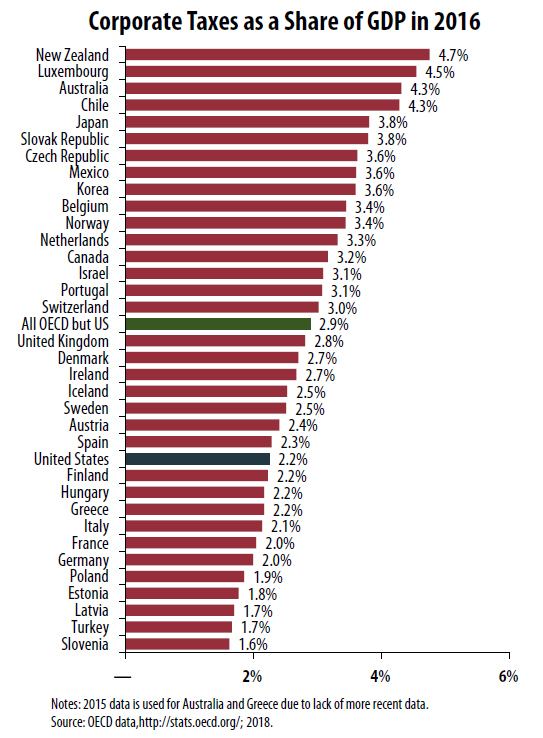 [ii] OECD data has supported this finding by revealing, year after year, that U.S. corporate tax collection as a share of its economy was already among the lowest. [i] Based on estimates from the Joint Committee on Taxation (JCT) and our own calculations, we find that the tax changes specific to corporations that pay the corporate income tax are estimated to reduce revenue by $135.5 billion in 2018, which is equal to 0.7 percent of GDP. U.S. corporate tax revenue as a share of GDP was 2.2 percent in 2016 according to the OECD data, but if TCJA had been in effect and had lowered that figure by 0.7 percentage points, it would be just 1.5 percent of GDP, lower than any other OECD country.